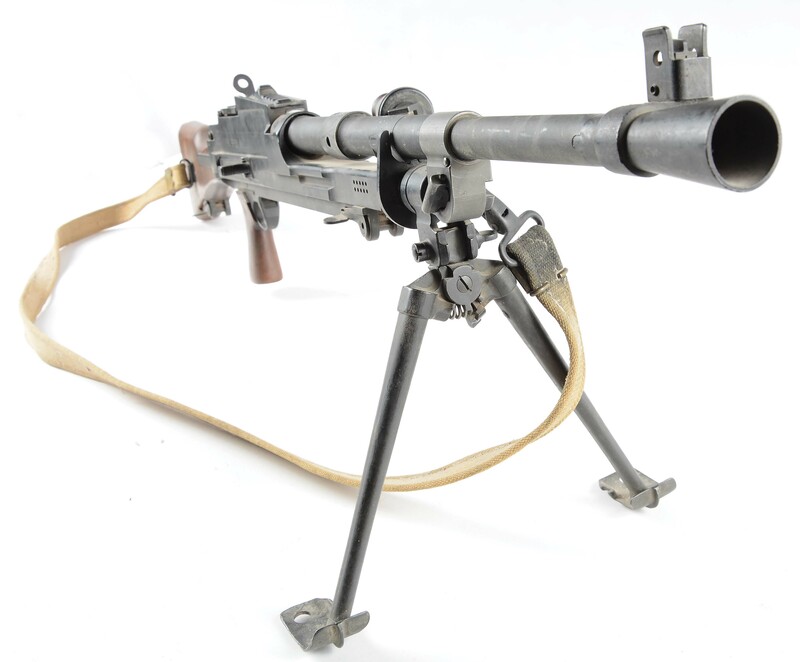 Lot Detail - (N) SUPERB HIGH CONDITION EXTREMELY DESIRABLE ORIGINAL 8MM BREN MACHINE GUN WITH ACCESSORIES (CURIO AND RELIC). (N) SUPERB HIGH CONDITION EXTREMELY DESIRABLE ORIGINAL 8MM BREN MACHINE GUN WITH ACCESSORIES (CURIO AND RELIC). 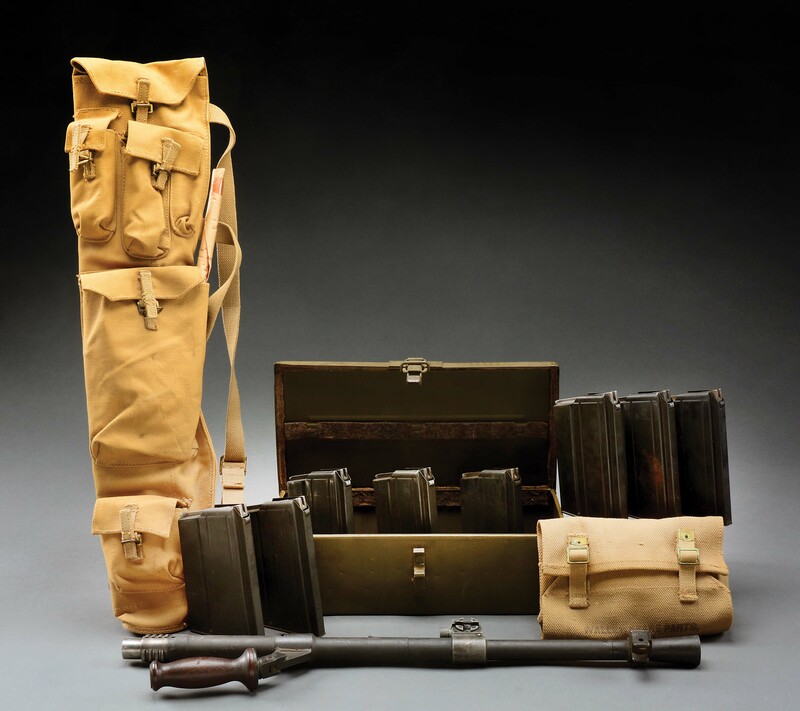 Superb and extremely desirable matching 8mm Bren select fire machine gun with nine magazines, original gunners cleaning kit, brown web sling, and gunners spare barrel bag with matching spare barrel. 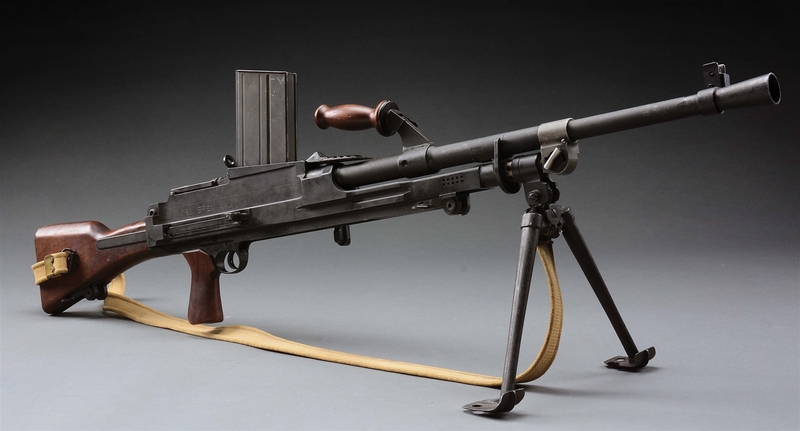 Yes, this gun comes with both its primary and spare barrel in the original gunners bag, matching the gun serial number. 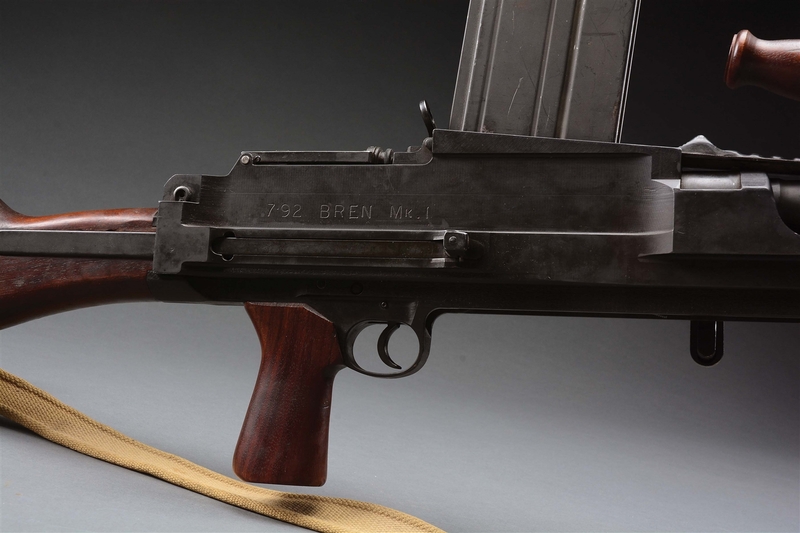 Marked on right side of receiver "7.92 BREN MK I" with serial number on top of receiver. 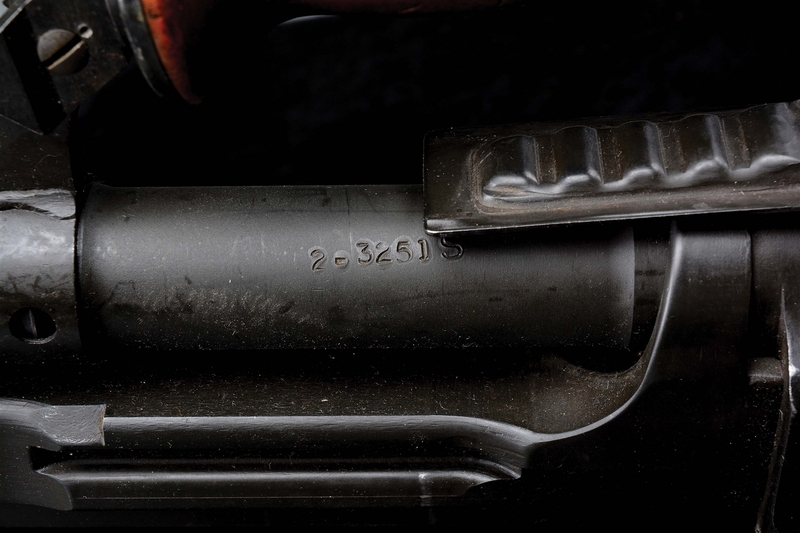 Barrel in gun marked "2-3251S" (indicating spare). 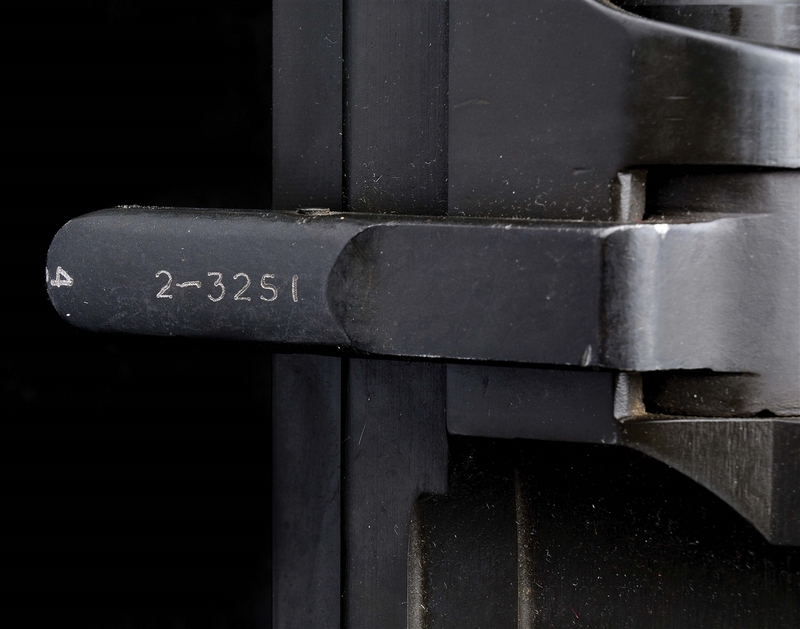 Primary barrel in carrier marked "2-3251". Visible numbers all matching. 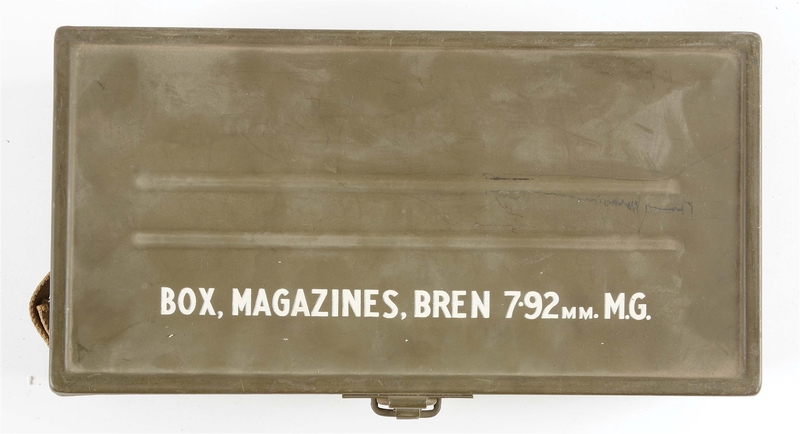 Original metal magazine box also included. Cleaning kit includes oil bottle, pull-through and disassembly tool. 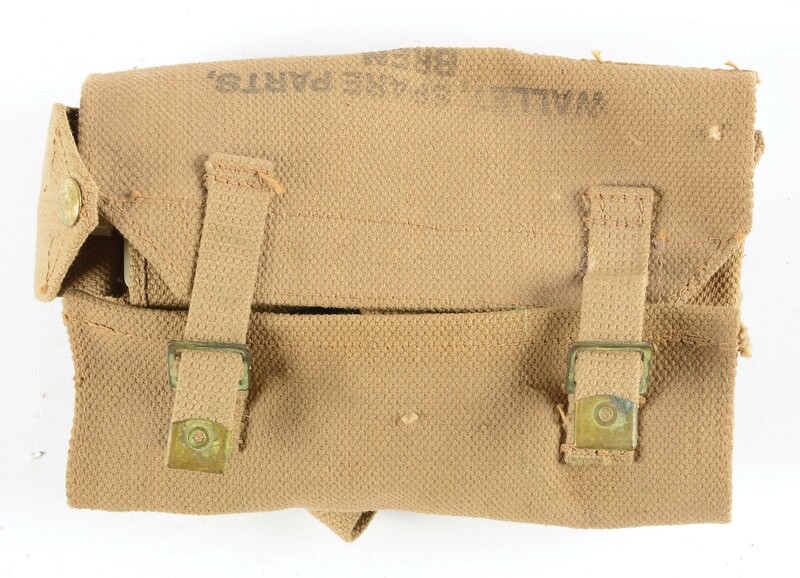 Kit marked "WALLET, SPARE PARTS, BREN". 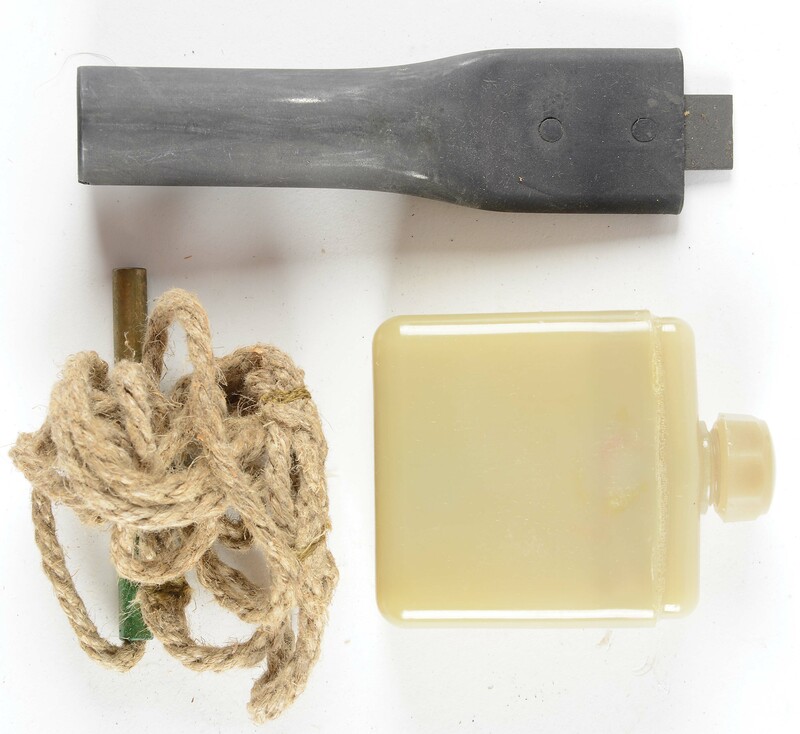 Barrel carrier includes wood dowel, tin box with two springs and spare extractor, and cleaning brush and oil bottle. The Bren gun was the culmination of the development of the Czech ZB-26 and ZB-30 series as refined in Britain and is generally accepted to be one of the best light to medium machine guns of World War II. 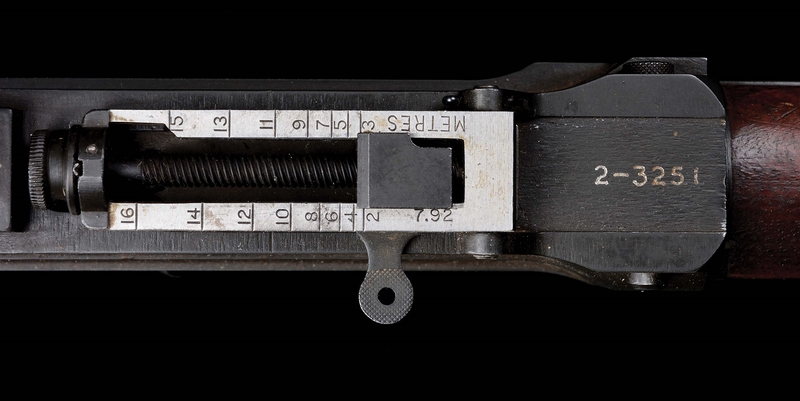 Sight is graduated in meters and is the correct 7.92mm rear sight. CONDITION: Overall appearance and finish extremely fine to near excellent. Smooth, grey finish and extremely fine to near excellent pistol grip with some handing marks and dings. 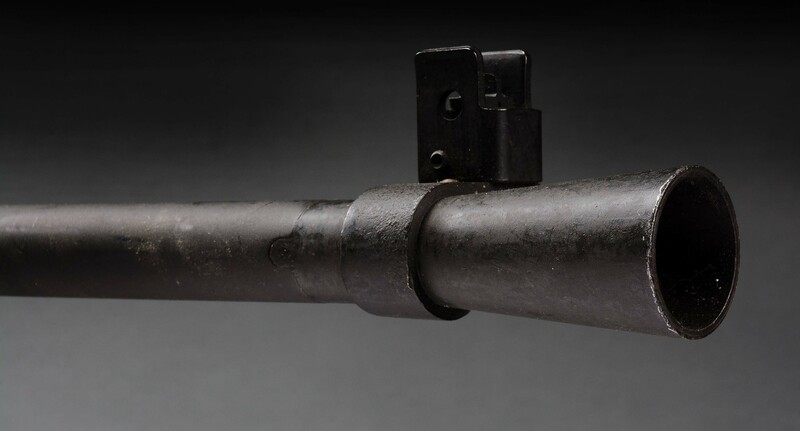 Primary barrel has near excellent, shiny bright bore. Second barrel has strong crisp rifling turning dark in the grooves. Bolt face is extremely fine to near excellent. Mechanics are crisp. 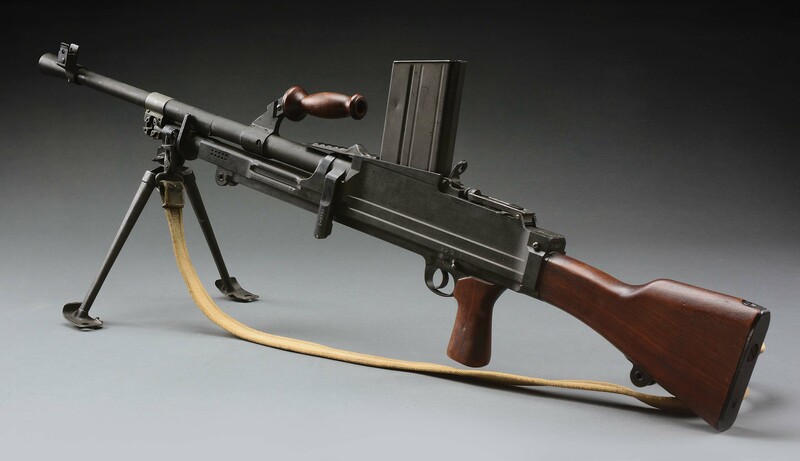 This is a select fire machine gun. 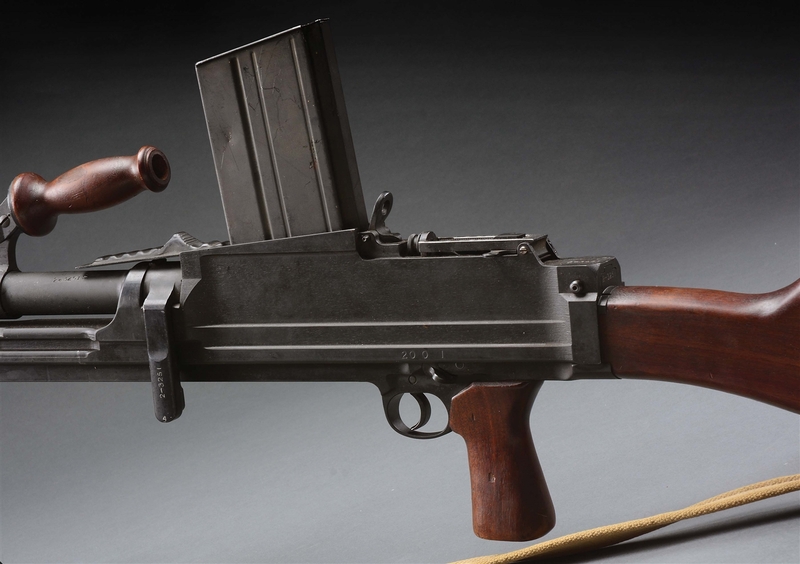 The 8mm Bren machine gun is generally the most sought after of this model due to the historical availability of this ammunition. 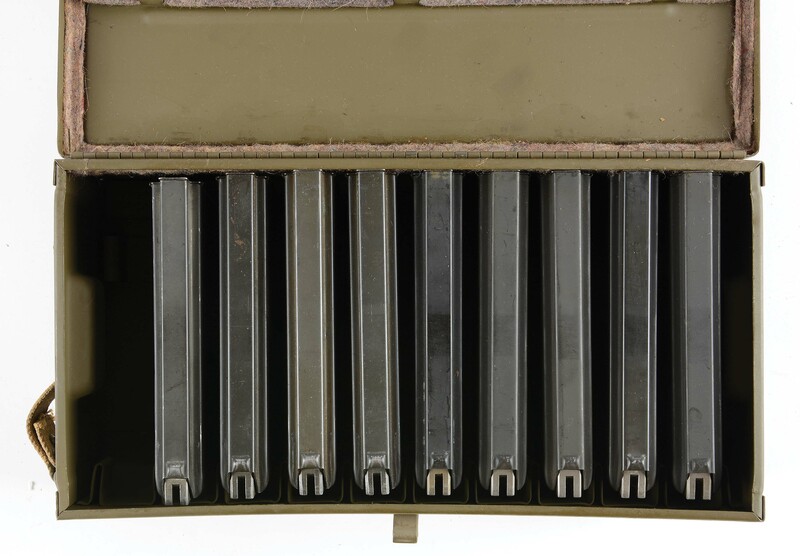 This specimen with two matching barrels and its original accessories place it at the very top of available specimens of this kind. 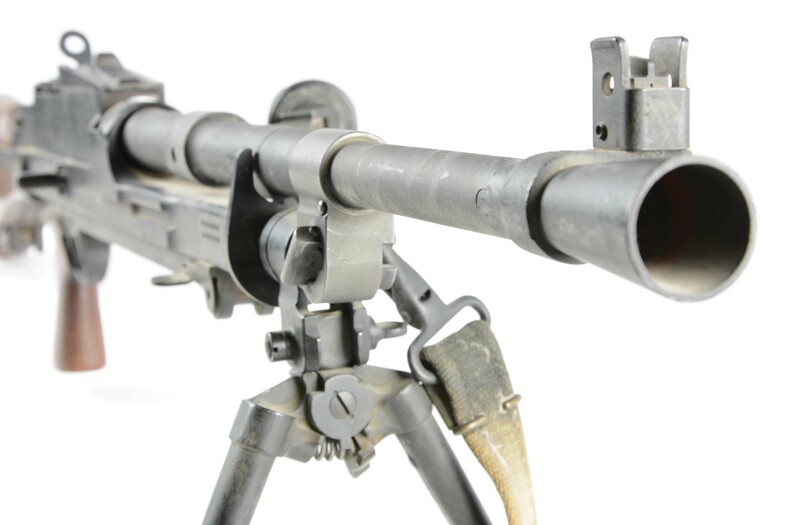 A fantastic opportunity for the machine gun collector/investor. From the estate of noted cartridge collector and World War II veteran William H. Woodin. THIS IS A NATIONAL FIREARMS ACT ITEM AND REQUIRES BATF APPROVAL PRIOR TO TRANSFER. THIS ITEM IS FULLY TRANSFERABLE ON AN ATF FORM 3 OR 4 AS CURIO & RELIC ELIGIBLE.